These numbers reflect student expenses for the 2018-2019 school year. Amounts will change slightly from year to year, but as the cost of college increases, the scholarship packages will correspondingly increase. Your official financial aid award will be included in a letter directly from Wesleyan. Outside funding/scholarships reduces/replaces the work-study portion of the financial aid award. Outside funding/scholarships in excess of the work-study award reduces/replaces the student summer work contribution. If the student needs the University's health insurance and/or a one-time purchase a personal computer, any funds in excess of replacing work-study and the summer work contribution can help subsidize these costs. If a student is not covered by a parental insurance plan, then s/he is required to participate in the University's health insurance plan. Health insurance can be purchased by the student. Cost can be met by the student requesting need-based student loan or using outside scholarship funds that remain after replacing work-study. 2018-2019 Cost: $2,176, not included in Cost of Attendance above. For students living outside the Northeast region of the United States, Wesleyan adds a travel allowance to the estimate of the total cost of attendance, and in turn increases the amount of Wesleyan grant offered. The travel allowance amount will vary depending upon the distance between home and Wesleyan. It is expected that this expense will be paid for from the student contribution and/or work-study. Satisfactory academic progress in accordance with federal and institutional policies. Wesleyan meets 100% of the demonstrated need of all admitted students. Undocumented students are considered for need-based financial aid like any U.S. citizen or permanent resident. Because federal financial aid is not available for undocumented students, institutional funding is used in its place. Student savings is calculated at a rate of 25% of total student assets. For example, $2,000 in student assets equals a $500 student asset contribution each year. Wesleyan guarantees to meet 100% of demonstrated need. During the 2017-2018 school year, 48% of first year students received some form of financial aid. Over the past four years, an average of 48% of all students received aid. The average grant is $46,967. Learn more. 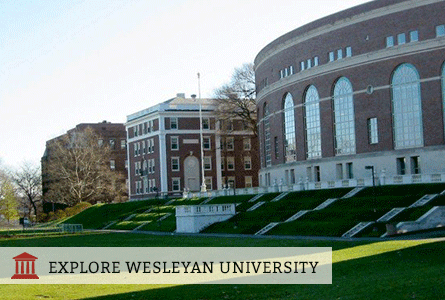 Find out how affordable a Wesleyan education can be for you! Use Wesleyan's My Intuition Quick College Estimator for a quick, ballpark estimate of your cost or Wesleyan's Net Price Calculator for a more in-depth estimate of the financial aid for which you may be eligible.